“Come here and turn me on, then turn me off, so I can only shine for you,” read one of the signs in Hobart House during Northwestern Green Cup. As the competition ended its eighth year with a closing ceremony Tuesday night in Norris University Center’s Northwestern Room, Hobart House finally took first place for on-campus residences without dining halls. The women-only dorm had come close several times in past years. 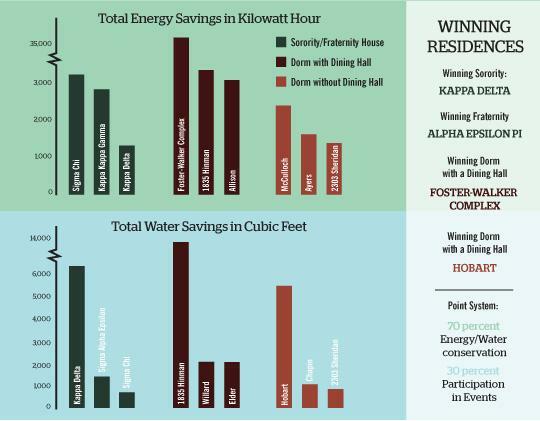 For the entire month of February, Students for Ecological and Environmental Development, which organizes Green Cup, encouraged competing residents to turn off lights and take shorter showers to see which residence could conserve the most energy. Aside from Hobart House, this year’s winners are Foster-Walker Complex for on-campus residences with dining halls, Kappa Delta Sorority for sororities and Alpha Epsilon Pi for fraternities. In total, the participating residences saved 55,321 kilowatt-hours of electricity, enough to power 57 American homes for one month, and 90,859 gallons of water, enough to fill 1,298 bathtubs. Hobart House residents, the dorm with the most attendants at the event, showed excitement at the announcement of their victory, especially after ranking close in past years, said Hobart resident Aozora Brockman. The winners were determined by a point system, 70 percent of which was determined by energy and water usage and 30 percent comprised of participation at events. SEED worked with representatives from Facilities Management, who sent out an employee to collect data from meters in each residence once a week. Two weeks before the competition starts, the department collects data that serves as the starting baseline for each residence. In previous years, SEED also took historical data from previous years into consideration. However, because there were numerous housing changes in the past year, especially in North Campus residences, the SEED executive board decided to exclude historical data from the point system, SEED co-chair Madeleine Steger said. “There were issues with frats and dorms moving and changing in size and place, so by having historical data, it wouldn’t reflect on having a new dorm or house,” the Weinberg senior said. Group Residence for Environmental Engagement House, which has won consistently in past years, moved in with the Residential College of Cultural and Community Studies last year. This year the two dorms competed as one entity, “2303 Sheridan Road.” Because of their new housing conditions, GREEN House residents faced difficulties and were less enthusiastic about participating in Green Cup this year, said Meredyth Gottschall, the residence’s Eco-Rep. The board calculates participation points by the percentage of each residence’s total population that attend events, which had sign-in sheets. NU Earth Hour, which was organized by the Eco-Reps of each residence, had the most participation, Steger said. The teamwork of the Eco-Reps contributed to the success of this year’s competition, said Rob Whittier, director of the Office of Sustainability. “A big part of the success this year was having the Eco-Rep program in a much higher gear than it was before,” he said. The main sponsor of the event, Julie Cahillane, who was also involved in totaling the data, said she continues to participate in organizing Green Cup every year because it not only spreads awareness but also builds community on campus. “When else can you think about whether the time you spend in the shower is excessive or not?” the manager of recycling and refuse said.